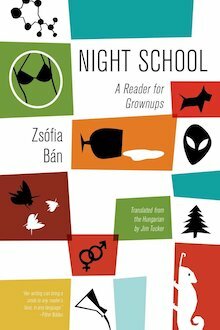 To celebrate today’s release of Night School: A Reader for Grownups by Zsófia Bán we’re giving away five copies. You can enter by emailing Anthony Blake with “Night School” in the subject line. But hurry! This contest ends tonight at midnight Eastern time. Now, onto the book itself! We’ll be posting a excerpt from this later today, but in the meantime, you can read “Mrs. Longfellow Burns” over at Electric Literature. The pieces vary in style and approach, though a common aspect to many of them is their foundation in textbook-subjects such as historical episodes and literary texts: Bán rips riffs off culture with abandon. In some, she offers her own reïmagining of historical events—Flaubert and Du Camp in Egypt, for example, or space-pioneer dog Laika telling her story (“I’m only whispering because I’m making this recording in secret”) in “On the Eve of No Return (archival recording)” (“Teacher’s Edition/Russian”). In others, she creates new fiction on old: there’s a “Fidelio (a blog opera)”; “What Is This Thing Called the Exchange Reaction? (destructive affinities)” (in: “Chemistry/Physical Education”) features the quartet from Goethe’s Die Wahlverwandtschaften (Elective Affinities) competing in a ping-pong doubles match, while “Mme de Merteuil Shakes Herself” (a “Geography/Biology/History” entry) is a beginning-of-the-new-millennium continuation (of sorts) of Choderlos de Laclos’ epistolary novel, Les Liaisons dangereuses—“an edited version of the subsequent correspondence,” now conducted as an e-mail exchange, beginning with letter 176 (and finding its conclusion in horrible-fascinating fashion in one final spectacular encounter that readers recognize will go off entirely differently from what the correspondents had in mind—though this is the one story that is arguably a bit too obvious (and sensational) in what it builds to). If you want to forgo the contest entirely, you can buy a copy from your favorite independent bookstore, online here or here or here, or via our website. But if you want to win, just email Anthony with “Night School” in the subject line ASAP!